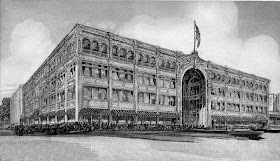 that was destroyed by fire in 1903.
became a landmark in downtown Sacramento. 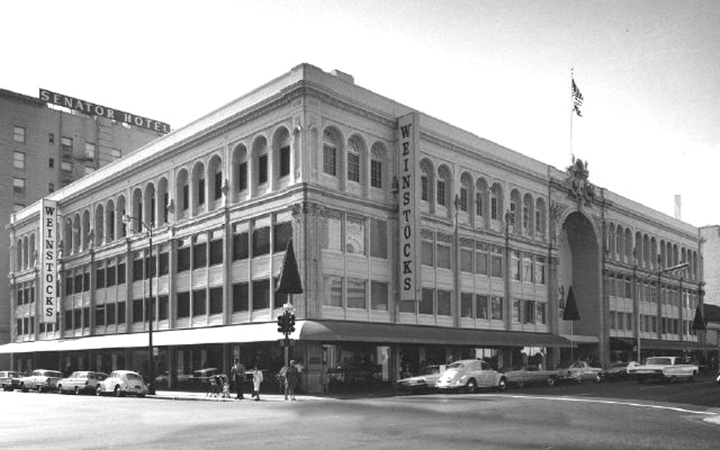 Note that Weinstock's, known at the time as Weinstock-Lubin, merged with its competitor Hale Brothers. 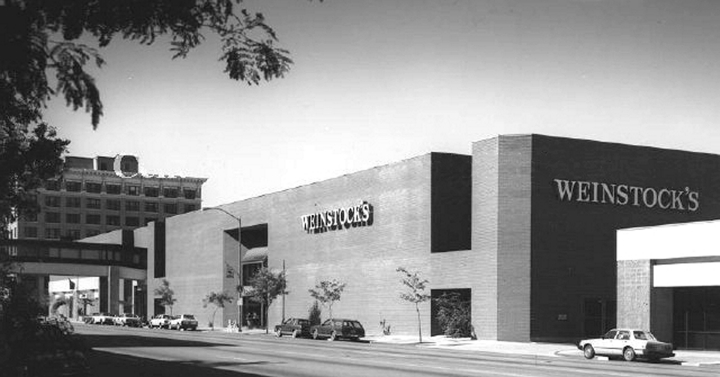 For a while, the stores were known as Weinstock-Hale, and Weinstock's acquired Hale's only branch, at Arden Fair. 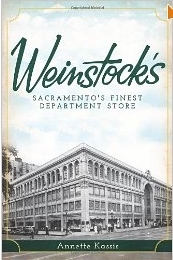 History Press has just released the book "Weinstock's: Sacramento's Finest Department Store". The Stockton store was originally at downtown through the 1963 acquisition of Smith & Lang. 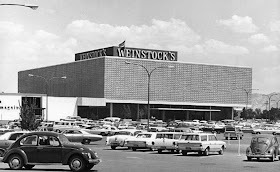 Weinstock-Lubin and Hale's merged into Weinstock-Hale in 1965, and became just Weinstock's in 1967. There was also a Hales at 9th and K which later became Wienstocks. For several years there were two Weistocks within 3 blocks of each other. 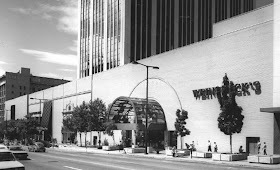 Also the 12th & K Weinstocks had a hair salon on the mezzanine and a restaurant in the basement. Grandmother worked in the salon at that location. Loved all the smells and color and excitement in that store. I have a small silver tray with the Weinstoc logo celebrating their silver anniversary. Just found it at a garage sale this summer. The fire that destroyed the original Sacramento store in 1903 resulted in the death of a firefighter, and injury of several others... just a footnote. HI TO WHOM IT MAY CONCERN. I GOT THIS OLD LOOKING BOOK THAT MY MOTHER BOUGHT FROM THRIFT STORE IN MIAMI, FLORIDA. THE BOOK CALLED FAR ABOVE RUBIES. BY GEORGE MACDONALD. AUTHOR OF "ROBERT FALCONER," "SIR GIBBEE," ETC. NEW YORK, DODD,MEAD AND COMPANY COPYRIGHT, 1898. IN BACK OF THE BOOK FOUND LITTLE WHITE STICKER WITH GOLD BORDER LINE SQUARE IT SAID WEINSTOCK, LUBIN & CO. SACRAMENTO,CAL. IS THIS BOOK I HAVE IN MY HAND REAL OLD BOOK? My Grandfather just passed away this year and I was left alot of grandmothers things and one of those was a Diamond Watch and I have the Diamond Certificate from September 12,1977 from the Reno store it's a beautiful watch.I was wondering if there are any more Weinstock's jewelry store left out there? David Lubin is my great grandfather. So nice to hear such interest in his store! Oh, memories! 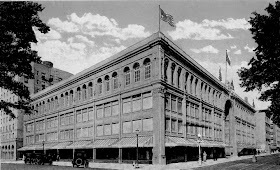 I worked at the store on K street in 1978 and then went to the big store, where I worked until 1984. The bigger store had a number of events where celebs like Andy Warhol, Donny Osmond, Phil Donahue, Richard Thomas, and others came. I still remember selling Marlo Thomas a handbag when I worked in the handbag department. She was mega sweet. I also got to model some of the furs one year and remembered how the cost of a long mink coat at $10,000 could pay my college tuition. Lots of fond memories. I worked full time in the junior department and Misses sportswear during 1982-the end of 1983 which helped with the cost of going to BYU. Thank you so much for this website. I am a history buff who received gifts from "Weinstock/Halle's in those signature red & green boxes from my grandparents. The boxes wore like iron -- unlike those today. Now that I've found your site, I'll look for more stores I might remember. Thank you for this website. I will be checking out more department stores I remember -- now that I've found you. While going to college I worked at the Arden Fair store (store #52) from the fall of 1968 until March 7, 1971. The store manager was Bill Hitalla and the head of personnel was Jackie Vance. The shoe department, where I worked, was managed by Ben Andrews. Also in shoes were Mike Nicotera, Mike Duell, Bob Frye, and Zella Pratt. In the adjacent cosmetics department was the lovely Bobbi Kivley (now Parker). Others I recall were Jim King, Cindy Rossi, Cindy Wheatley, Marlene Yaffey, Shirley Thomas (shoes 9th & K Street store) and Dena Lindsey (12th & K credit dept.). 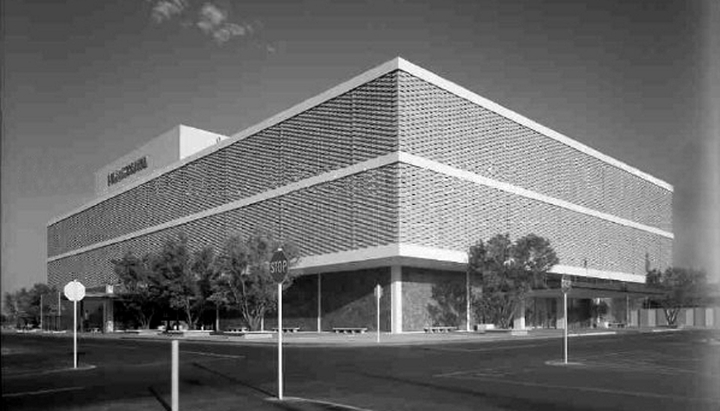 Country Club Plaza (store #43) was doing the largest sales business at that time followed by Sunrise, 12th & K, Arden Fair, Florin, and 9th & K.
Sometime during 1969 or 1970 Sears decided to open for business on Sundays. 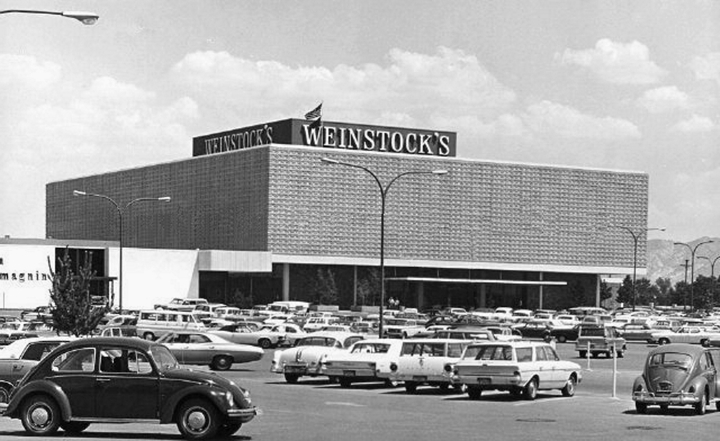 Weinstock's quickly followed suit by also opening on Sundays. "Premium pay", which amounted to time and a half pay, was paid those employees who "volunteered" to work Sundays. Starting pay was $1.65 an hour, the minimum wage at the time. Full time sales employees made as much as $2.45 an hour. 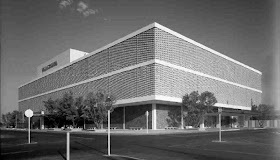 In the summer of 1970 a couple dozen employees from the Arden Fair store were among the Sacramento Weinstock's employees who moved to Fresno to open and staff the new store there. I have a 1910-1911 Weinstock Lubin & Company Fall & Winter Catalog. If interested let me know at mustardseed@centurytel.net I can send photos if needed. Thank you Bob for your work on this site. I worked at the Arden Fair store from about 1968 to 1972. I remember Bill Hitela the store manager, John Redmond the asst store mgr, Jackie in HR. Those were fun days. I am trying to locate a fellow worker by the name of Sherry who worked in HR under Jackie. If you have any information on how to reach her, please send it to me at esyoung805@gmail.com. I worked in the Beauty Salon at 12th and K. It was on the mezzanine floor. Do you remember the last name of Sherry who worked under Jackie in Personnel at Arden Fair at the same time you and I worked there? I bought a sable fur coat at county club plaza store mid 80s took it back each summer for storage in their cold closets. Weinstocks was my second charge card only because I had worked at Rhodes. This store location is sorely missed as Macys. I will not go to downtown Macys. I did charm school Sears Arden Fair around 1963 or 64. We could drive out the back of Arden Fair to avoid the traffic. That is closed off now. 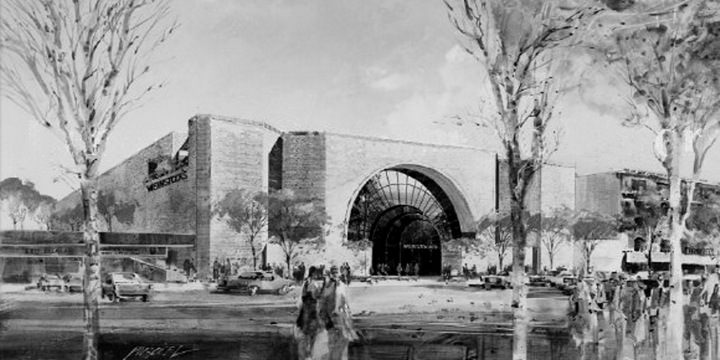 I remember Arden Fair way before the mall was created to enclose all the stores. Nice to grow up in Sac. Mom and I would go to all the stores looking for bargains. Southgate, Arden, County Club, Sunrise, Downtown. County Club Plaza had a food court in the late 50's, replaced with Penney's. I worked there one Christmas 1972. Sac. was good for shopping.